Give someone a present they will never forget with one of our gift vouchers. Treat your loved one, a friend or family member to a 'once-in-a-lifetime' experience. 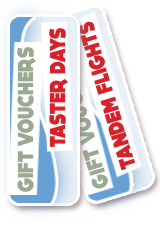 Vouchers can be purchased to suit your requirements, but normally vouchers are for one of our Taster Days or a Tandem Flight. Due to the nature of our sport you can either pay for your voucher in advance or on the actual day. We will provide you with a personalised voucher which will indicate whether it has been pre-paid. On receipt of your voucher request we will contact you to confirm whether you wish to pay for your voucher in advance or on the day. Please note we only accept cheques or cash.